"The Specialists in Media Sales"
Arlington Publishers Representatives, Inc. has been headquartered in the Chicago area since 1980. Chuck Oestmann, a former business-to-business publisher with 34 years of experience founded APR knowing what publishers come to expect from their representation, he created a company designed to fit their needs. Jim Oestmann joined the firm in 1985, with 15 years of sales experience. We employ a long term "consultative" selling strategy for weekly, monthly, bimonthly and quarterly publications. 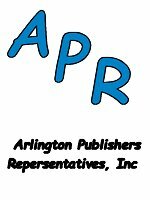 Mastering a "team selling/teleselling" approach, coupled with close attention to both the advertiser's and publisher's needs, has allowed Arlington Publishers Representatives to consistently grow throughout the years to better serve every one of our publications. The economic benefits of dealing with a highly successful rep firm like APR equips you with a solid foundation of which to build upon. Our customized services go beyond selling magazine space... we also sell space on the Internet, CD-ROM, offer complete billing services, use ACT computerized sales tracking, and much more. Copyright © 2018 Arlington Publishers Representatives, Inc.